Saturday 1st. 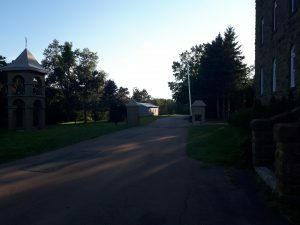 In front of the guesthouse, there are only two cars, Prince Edward Island licenses. It is always a good feeling to see that plate. Brother Glic and Father Innocent have taken some wire once used to enclose a field to use for the grapevines, which support themselves on the wire after climbing stakes. Sunday 2nd. Earlier in the week, it seemed as though the black capped chickadees had reappeared for their usual stay through to the end of winter. Today, up close, I could see that although it was the same song the bird is plainer, finer, light brown. Monday 3rd. The new audiobook for refectory is Galileo’s Daughter, by Dava Sobel. The narrator, George Guidall, has a lively style reminiscent of that of William Conrad, narrator for the Bullwinkle and Rocky TV show. It helps to have a bit of boom in your voice, and they both do. In Chapter this morning, Father Innocent sketched out possible plans for our patronal feast day the 15th. Tuesday 4th. 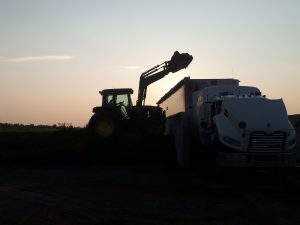 More silage was loaded for sale, beginning well before dawn. The repair shop bay door open, lights on at night is nice. In daylight, a lot of drilling by the refrigeration company produced a hole in the stone wall of the monastery, for connection of the new freezer compressor. At the same as this crew got started, an electrician was by to fine-tune the water pump hook up. As I said hi to him it struck me that being a technician for many years, or an electrician, can bring people a gift interiorly. Thursday 6th. 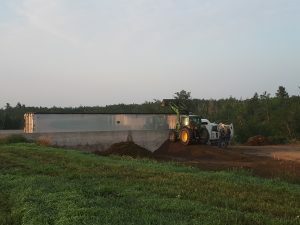 The blue dump truck which served for so many years is now for sale, it is parked on the highway. Brother Stephan began getting inquiries right away. The dump truck turned 42 this year. After a first quite cool evening, the feel of things changed in town after sun-up; and fine webs on our cemetery gates were made visible by dew. Friday 7th. 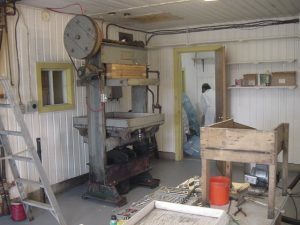 The apple juice press has been moved into what was the milk house, now emptied of equipment. The next step planned will be to paint the floor there. 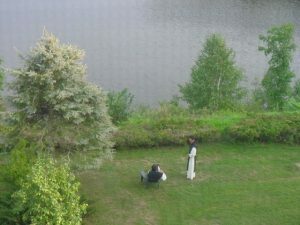 Father Innocent went to Moncton today to pick up a retreatant who had flown in from overseas for a retreat. No sooner than the walk-in freezer had rediscovered its groove, it began to fail to maintain minus ten temperatures. So the crew came back and added a part to the compressor to make it more able to function outdoors in our climate. Saturday 8th. Different people noticed this week that the back door’s wooden fame is starting to go, and the sill is tumbling off. Sunday 9th. Having retired a week ago, Father Clovis took leave of us yesterday evening, driving away in his red Ford Focus one last time after stopping in at dishes to share some goodbyes again, and share some laughter. He was chaplain to the Sisters over the course of 14 years; 14 years which passed quickly. 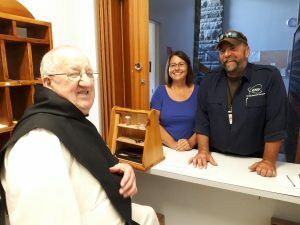 A northern New Brunswicker, he is a Eudist Priest and recently turned 80. 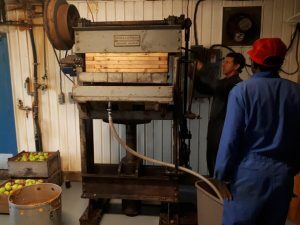 Apple press installed in the dairy. Br. Glic in background. Monday 10th. A guest is taking daily walks on the long circular drive out front, which also branches off onto our grotto and lakeside trail. A lady from town also walked about there this week, as she has for years. Is the climate changing? The insects seem to react differently to late summer conditions this year: they’re slowing down differently than other years, and show up differently, stalling near and in the building. Tuesday 11th. Brother Léo was reminiscing about Nova Scotia, where he once worked, today. He said it’s the most beautiful part of Canada. At Chapter this morning, Father Innocent explained that the Sisters will join us for our Patronal Feast day Saturday. Mass will be at a special time, 10:30, then we’ll have lunch. Wednesday 12th. 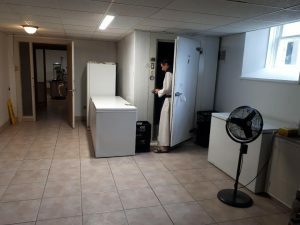 Brother Stephan worked on the closure of the walk-in freezer, which is not sealing as tightly as it could. Thursday 13th. Simone and Brian and Father Roger put up the canopy for our festive lunch Saturday. Between the drive and the lake, there’s just the right amount of lawn for this sort of set-up. Friday 14th. 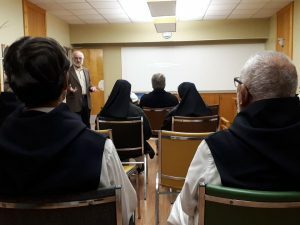 Father Roger attended a New Brunswick chicken producers meeting today. With today’s Feast of the Exaltation of the Cross, we resumed wearing the cowl at Vespers for the cooler months of the year. Brother Léo’s niece and her husband surprised him, driving up to his window at the entrance in a crane truck. They were smiling away, seemingly the jolliest of workers, as he could not recognise them till they stepped in. Saturday 15th. We sang the Office of Tierce separately today, at 8 AM, rather than as part of the Mass. Mass went well, with the Office of Sexte integrated at the beginning. We had a lovely meal under Simone and Guy’s Coleman canopy, the day warm enough that autumn seemed much more than a week away. Time seems to slow down when we have the chance to reunite with our Sisters. Then Father Wislais the Parish Priest surprised us by dropping in. He and Father Innocent then went and assured the once-annual Mass in Kent Junction this afternoon. Kent Junction is only a few minutes south of here. Sunday 16th. John has put in a new back door, and he plans to put a window in it next. 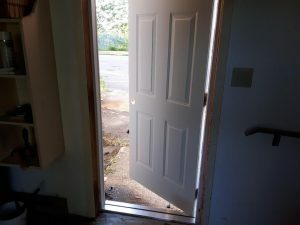 He says that storm doors that are installed to swing out, last longer, the old doorframe had rotted partly because the door opened in. Guess it’s the way the sill drains. Monday 17th. The cluster flies, which look like a slightly smaller version of house flies, have made their seasonal migration to our indoors. This year, however, their pep is gone, they don’t seem to be cleared for take-off: maybe the unusual humidity, ongoing for close to three months has taken the ping out of their wings. Brother Léo’s reception desk phone broke down today for a while, and you could not tell if someone was calling in or not. Tuesday 18th. American-Canadians summering next door are gradually making their way back across the border. Their seasonal presence to their families in town is a reminder of how beautiful life is. In Chapter this morning, the question was raised of maybe scaling back on accrued decorations which have shown up fairly haphazardly in the guest house over the years. Wednesday 19th. Most of the community took part today in apple juice production, in the nicely-appointed new space for this. The apples are ground up, whole. 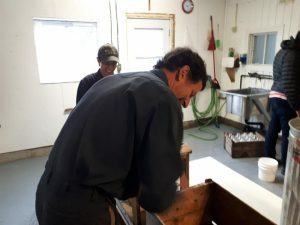 Then the pulp is pressed. Then bottles get filled. This first pressing went surprisingly well, considering none of us were involved in the production last year. Thursday 20th. The walk-in freezer was at a reassuring minus 12 this morning. Father Innocent posted the proposed schedule for the Shroud of Turin session next week, to see what the monks thought. Diligent work has been taken up again on the heating system. Friday 21st. There was a mist off the lake so thick this morning, it could pass for wood smoke. This afternoon, a small family was picking apples together in our little orchard. The children were just big enough to reach the lowest boughs, and were enjoying it to the point of nearly knocking themselves out. In the guest-house, our mother-in-law / daughter-in-law cleaning team were working away. Saturday 22nd. John neatly cut a rectangle in the new back door, and put the old door’s window in; it is reassuringly dirty, just like before. Freshly made coffins have been brought in, they’re stored right across the hall from where I’m writing. They look nice. Naturally plenty of jokes are made among the monks, about our future coffins. Sunday 23rd. Our lawn chairs are getting blown around now, more often than sat on. As nature begins to quiet down, the lake becomes more striking, seems more central, just because a little water’s rippling. The pigeons seem to be holding on and letting go of the end of summer by their stance on the roofs, their behaviour. Monday 24th. Dust and tractors moved around us, as the farmers renting our fields stored silage here. The geo-thermal heating system, after being tested last week, is now successfully through its maintenance run, and the flick of a switch will activate it for winter once temperatures become more serious. Our professor arrived from Colorado Springs just before midnight, in a fairly upbeat Moncton Airport. The nachos in town were up to the standards of this fellow who lived many years in Southern California, amidst abundant Mexican cuisine. Tuesday 25th. Emmanuel Bible Baptist Institute students were here for a tour this morning, accompanied by their history professor, and their pastor. Barrie Schwortz gave his initial presentation on the Shroud of Turin this afternoon. Several friends from town sat in, as well as three of our Sisters. It was a one-of-a-kind opportunity to share the adventure of Shroud research going back forty years with one of the original, 1978, research team members. A good week. Wednesday 26th. Barrie and I were standing outside this morning, looking at the Acadian flag, and talking about US politics. I guess each person, whatever their views, really does have a unique take on their people’s challenges, reversals, chances. The heating was turned on, after some crisp moments inside. Then it got milder out, predictably I guess. Thursday 27th. Brother Stephan, who had the inspiration to bring Barrie here, showed him around a bit today. This morning a little frog was huddled outside in the corner of the window of the back door. He looked cold, and strong. Friday 28th. In Dieppe this morning, Brother Henry was following the Kavanaugh nomination process on CNN, as many other Americans likely also were. The big, red doors in the chapel have been closed until next spring. Closing them pulled them away from the stone wall where they were hooked, and pulled apart a hornets’ nest built behind it, hidden; and empty now. This evening, the eagle was on its perch and two other eagles flew around just a little, singing. Their song is high, and strong and soft. Saturday 29th. 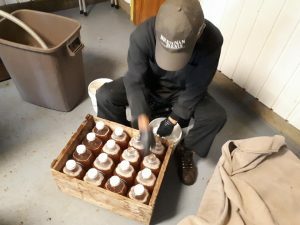 Today was apple juice day, and the team assembled for a good part of the day, as many lovely apples found their way into bottles. The hydraulic press, which is not of recent vintage, went through some dicey moments. Steve had to get a new belt. Then he had to get a third belt, and also got a better pulley, in the Miramichi. By sunset the juice was tucked away in one of our freezers. Sunday 30th. A guest originally from India prepared a meal for us this evening, before departing in the new week.